Hugh Dallas and Willie Young were competitors as well as colleagues. They were aware of each other first as rivals as they progressed through the ranks as referees, beginning in the wilds of the junior leagues. That was where Young initially shone and Dallas learned lessons about how an official's style influences the way players react. Young was put in charge of the big rivalries - Auchinleck Talbot v Cumnock, Pollok v Petershill - while Dallas was less high-profile. "I was never rated in the juniors," Dallas says. "I was very black and white as a referee at that level, where Willie used his personality. "People probably won't realise that refereeing is very competitive. "You're trying to climb up that ladder to get to the top level, category one, and Willie and I were big competitors. "We both came to the list within a year of each other." Dallas and Young became central figures for a generation of referees. In their early days, they worked with the likes of Bob Valentine, with contemporaries like Stuart Dougal, Kenny Clark and John Robowtham, then a new wave followed, including Willie Collum, who is now coached by Young. There were famous games, remarkable incidents and endless personalities encountered along the way. There was also an enduring friendship, as well as shared experiences, although Young was watching on television during the most infamous, when Dallas was struck by a coin in an Old Firm game in 1999. "People talk about the terrible atmosphere in the stadium and it's something I wasn't conscious of," Dallas says. "I always remember coming off at half-time, after the coin incident, and the guy coming into the dressing-room with smelling salts and big John Rowbotham [the fourth official] grabbing them and saying, 'are they for me'? "There was a wee bit of humour at that time, but back out for the second half and just get on with the game." Like veterans, Dallas and Young can share tales of the Old Firm battlefields. 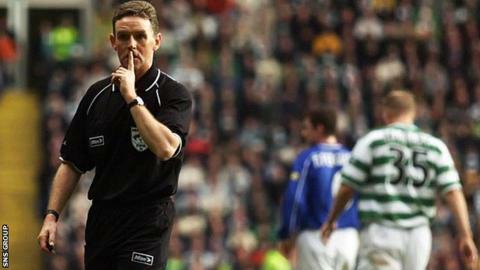 Three weeks after the coin incident, Dallas was the referee for the Scottish Cup final between Rangers and Celtic, while on his first visit back to Celtic Park the following season, he had to send off Stephane Mahe, the player whose dismissal inflamed the tensions in the first half of the coin-incident game. Young, too, has stories to tell of being in the midst of the fiery nature of Old Firm encounters, including the one at Ibrox in which Paul Gascogine and Paolo di Canio made their debuts. "They discovered adrenaline was brown," Young says with his ever-present dry wit. "Clearly, the Old Firm concept hadn't been adequately explained to Di Canio and [when] Rangers were leading 1-0, the ball went into the Govan Stand, full of Rangers fans. "Di Canio, oblivious to what was going on around him, ran over, jumped the advertising hoardings and leaned into the Rangers crowd to get the ball. "I was thinking, what do you do if a player goes missing during a game? "The Rangers crowd was so startled that they parted and he lifted the ball out cleanly. When he came back on to the pitch, I gave him a lecture and he couldn't understand why. "Honestly, it's the fastest 90 minutes of your life." Dallas refereed the 1996 League Cup final when Gascoigne and Rangers team-mate Ally McCoist clashed with each other on the field, while Young had to send off Chic Charnley once after the player punched his Dundee team-mate, Robbie Raeside. There were games when they worked together, too, one as the referee and one as the fourth official. The relationship survived those pressures, not least because of their shared sense of humour. "There was one occasion when Hugh was acting as my fourth official, at Aberdeen against Celtic," Young says. "I awarded Celtic three penalties and they missed two of them. Aberdeen were winning 3-2 with a minute to go when Craig Burley came running by me and said, 'Willie, Willie, any chance of another penalty'? I said, 'Craig, I would need to take it for you to make any difference'. "At this point, it was really tense, Celtic were pressing and Hugh looked over to me to see how many minutes of additional time I was adding on. I signalled to him, four, and I could see the look of disbelief on his face. "Hugh held up the four minutes and he got a volley of utter abuse [from the Aberdeen fans]. When we went into the dressing room, Hugh said, 'By the way, I'll get you back for that', and so he did." The pair were working together again weeks later, when Dallas was the referee for Turkey v Germany in Bursa, a game that would decide the home nation's fate in the European Championship qualifiers. "So Turkey were winning 1-0 and Germany were pressing and pressing, they were down to 10 men and I thought, this is payback time for Mr Young," Dallas says. "I looked across and signalled six minutes. "I've never seen as much debris being thrown [at the fourth official]." They both break out into sustained laughter. "That's what refereeing has done for us," Dallas says finally. "It's been a very special friendship, a great bond." Listen to the full interview with Dallas and Young from Thursday's Sportsound programme.